Ask Andy comes back from summer vacation on Monday, October 8th! You won’t believe where he’s been, either. 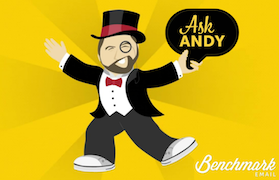 Ask Andy explored the cosmos to find the answers for the best ways to increase engagement on social media. Don’t miss the results when the video debuts on Monday. To celebrate the return of Ask Andy we’ll be giving away not one, but two GoPro HD Heroes. All you have to do is subscribe to the Benchmark Email YouTube channel to be eligible to win. That’s it! The contest begins today and will run until Monday, October 15th at 9:00 AM. Enjoy the video, share it with your friends and put its lessons to good use. Comment on the blog or on YouTube and let us know your favorite methods to increase engagement on social media. would love to win one of the GOPRO hd cameras so i can create even more of my awesome benchmark weekly 'Notes of WISDOM' ...including some video coverage !!! thank you benchmark ! you're the best!